Let’s face it, the only way you’ll get faster sprinting is by sprinting in your workouts. 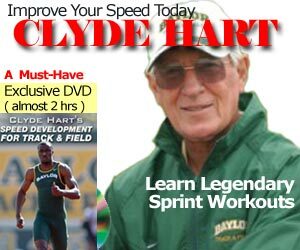 That being said, sprinting is all about stride length and stride frequency. Finally, the primary way to improve stride length is specific force application on the ground. This means you MUST get stronger in both vertical and horizontal forces and its displacement. I won’t get into the “how strong is strong enough” debate as Derek Hansen wrote a great article on that previously. What I do want to emphasize is whatever exercise you choose must TRANSLATE to the force on the track. Obviously, sprinting translates very well. Bench Press will make you good in, uh, Bench Press, unless there is a contest where someone sits on your face. Let’s keep this Blog family friendly. SIDENOTE: I love bench press because it keeps me steady in the “On your marks” and “Set” position. I am approaching my 8th year on this Blog, and I still choose 2 exercises to get me stronger for me and my athletes, and that is Weight Training and Plyometrics. Weights Training… as in free weights, Olympic lifts, and using gym equipment. Plyometrics… as in body weight exercises using gravity from boxes, to medicine balls or med balls. Of course, my choice of Weights and Plyometrics has changed from trial and error and experimentation over the past 8 years (as Stu McMillan points out regularly on his Twitter feed). My body is a chemistry and physics experiment. Even Arthur Lydiard experimented on himself with his high mileage theories. He even tried 200 miles a week which left him tired, so he cut back to 140 miles a week. There is another component of getting stronger and that is the “balance” exercises with swiss balls, bosu balls and trampolines, but we’ll save that discussion for Adarian Barr or other experts on this subject matter. Do you have access to that equipment? Will it translate to the track? Will it work both vertical and horizontal displacement, the same vectors you need for sprinting fast? Can you incorporate single and double leg actions? Where in the annual plan (macrocycle, microcycle, mesocycle) do these exercises fit in? Where in the daily workout do you do Plyos? We do them after the running portion and before the weight room, preferably outside. Do all event athletes do the same exercises? Speed, power, and strength requirements differ for all event types from 100m to long jump. Do all athletes, from Youth to College to Elite to Masters, need to do the same exercises? Will it translate? Do Masters really need to do 48″ box jumps? Is it worth the risk? What is the risk and benefit? I see everyone do hurdle hops… which leads me to the Trey Hardee Hurdle Hops and the inspiration to this article. Arm action and co-ordination is important, especially when doing bounding or hurdle hops. As a former triple jumper, the first question I raise is arm action, especially in the Step phase. (see RM article) Do you use single arm, or double arm (Russian style)? Strength, Power and Speed are all important to a sprinter, but honourable mention on that list is co-ordination (and to some extent, agility and flexibility). People think the reason why we do plyometrics is for the stretch reflex. If you haven’t seen this, go to a doctors office, sit on a table, and let him tap under your knee cap for that reflex. Otherwise, simply go to youtube and watch the rear foot from a slow motion starting block movement. High school coaches teach the importance of the stretch reflex, which is partially correct. As your sprint times decrease, and your top end speed increases, you will need greater forces at ground contact, with a shorter ground contact time. But you will also need to excite the muscles faster for top speed sprinting, but at the same inhibit and relax the antagonist nerves and muscles as compared to an average sprinter. You want a full extension coming out of the blocks for maximum power, from the tip of your toes right up to the base of the neck. And that includes your arms and hands. Med ball toss is one of the methods to teach this. Try playing golf on a sheet of ice. Note how much your legs are used to swing that ball. Sales with med ball toss. Your legs are push on the ground and all that stored energy is being transferred to your hands and to the med ball. I think this video (and the short shorts) explains it all! Split Jumps and Tuck Jumps. Split Jumps are great when you are limited in space and ceiling requirements, such as hotel rooms! Low level Hops: single and alternating. Aim for height, work the hamstring, and keep ground contact time to a minimum. As soon as you land, bang! Bounding (for distance). Arm action is crucial here, whether it’s single alternate arm or double arm action. Med Ball Toss. See my notes on full extension above. Box Jumps or Depth Jumps… but PLEASE be realistic with the heights. You don’t need much, as little as 1 foot or 30cm high. Teaches reactive forces and stretch reflex.. Jumps Decathlon – for variety and bragging rights, right Ian Graham? I’ll talk about the Jumps Decathlon table in another article. Usually I reserve this during testing week. 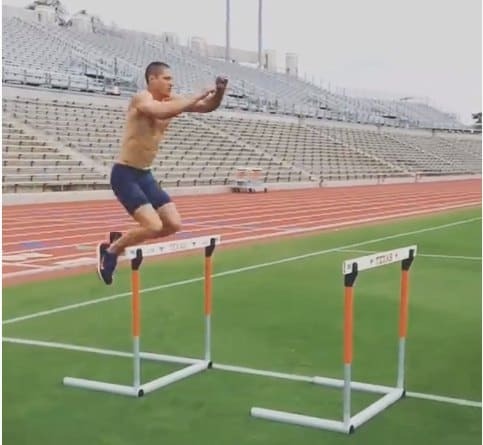 Fabien Ngô wrote a great 2 part series on Hurdle hops on this blog. See: Hurdle Hops and Extended Bounding Parts 1 and Hurdle Hops and Extended Bounding Part 2. Take a look at this video and watch the pre-tension and explosion upon landing. And note the use of rhythm and coordination of the arms.